It's finally Friday! Everyone is looking forward to the weekend. We are supposed to get some fantastic sun filled warm days this weekend, looking forward to that! Don't you just want to get out in the yard and start cleaning it up!!! 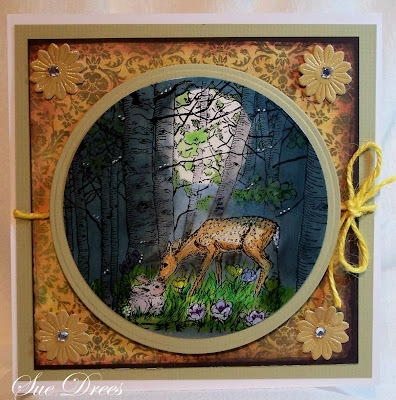 Today's card is for the challenge at Craft a Scene # 3, and the theme is Moonlight. I am so enjoying getting back into scene stamping. 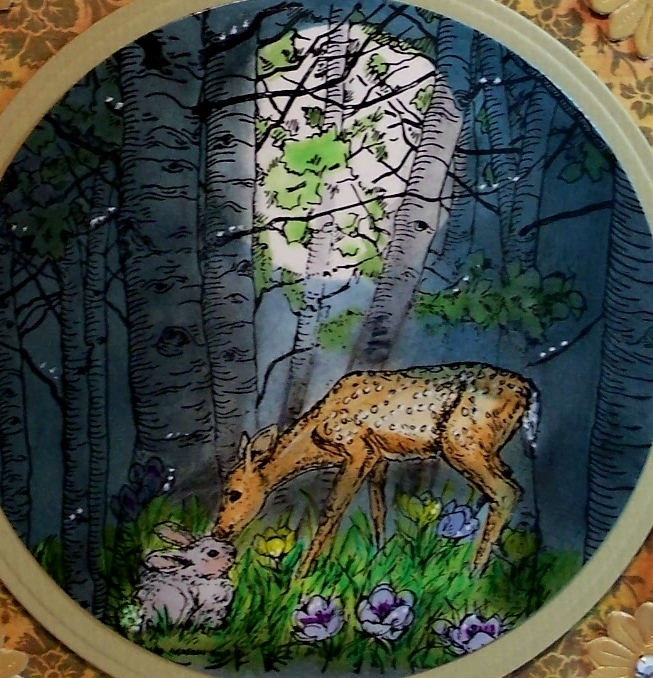 and the deer and bunny is Northwoods rubber stamps. 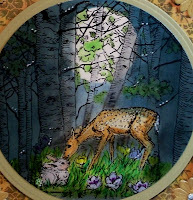 I used the Ranger sponge applicator to lay down color and colored with Tombow markers. Started with light blue ink and went to black. Placed a circle of paper to form the moon. Paper from Bazzill, Basic Gray and white cardstock base. Leather flowers from the sewing department at JoAnn's. I love your card! Such great nighttime colors and the deer is fabulous. Beautiful card! wow sue this is stunning a gorgeous card you have created. I have been back to see this card 3x now and all I can say is "Wow"! Some of the older retired stamp are amazing. craft a scene....that can you so great. it is realy a beautiful scene. the moon light looks so real. great coloring!!! these challengeblog make beautiful examples. Oh my such cool stamps and such a wonderful nighttime scene...LOVE IT! What a beautiful card Sue! Your moonlight is perfect and I'm lovin that fawn! You never cease to amaze me with your work! Thanks for playing along with us at Craft A Scene this month! What a precious and touching scene. I love the images and your moonlight coming through the trees is perfect.